Hurricane Irma did more than destroy thousands of buildings and take dozens of lives. The natural disaster also resulted in more than one hundred inmates escaping from a prison in the British Virgin Islands. 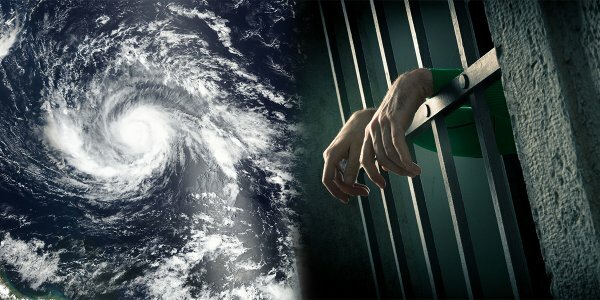 Sky News reports that more than 100 prisoners escaped from the correctional facility after Hurricane Irma slammed into it. The exact number is not yet confirmed, but some reports say more than 120 inmates now run free. Though Hurricane Irma weakened to a Category 3 Hurricane, the National Hurricane Center (NHC), later confirmed she has since strengthened back into a Category 5. As a result, a Hurricane Watch is still in effect in parts of the Caribbean, Cuba and Florida. According to the NHC, Irma made landfall on the Camaguey Archipelago of Cuba late Friday. The hurricane has sustained winds of 160 mph. Metro relays that Irma is now fast-approaching Florida, United States. Unfortunately, Irma isn’t the only active hurricane wreaking havoc. Hurricane Katia (Category 1) is making landfall north of Tecolutla, Mexico — the same country that was rocked by a devastating earthquake yesterday. And 265 miles east-southwest of the northern Leeward Islands, Hurricane Jose has nearly strengthened to a Category 5 with winds topping 155 mph. Don’t forget — in Southeast Asia, monsoons continue to ravage farmlands and buildings. As a result, more than 1,200 people have died, and thousands more have been displaced. And in California, Montana and the Mediterranean, fires are raging. While it is likely these some of these events have been heightened by the sun’s recent solar flares, this cannot be confirmed. However, it has been established that climate change exacerbated by mankind’s unattainable habits has resulted in warmer waters and increased precipitation. As a result, nature’s fury has been elevated. At the very least, hopefully, these happenings encourage more people to adopt sustainable, eco-friendly habits before it is too late for future generations.
? 9 Visionary Mandalas That Can Spawn A Psychedelic Trip Scotland To Ban Sale Of New Gas And Diesel Cars By 2032 ?